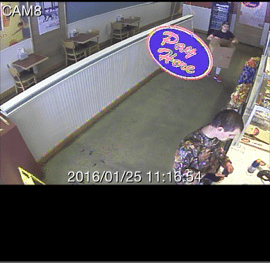 Between Jan. 23, 2016, at 10:30 p.m. and Jan. 24, 2016, at 12:30 a.m, an unknown person stole a purse from a patron at Murphy’s restaurant, located at 747 West King Street in Boone. On Jan. 25, 2016, the suspect then used the victim’s credit card to make fraudulent purchases at Big Lots, Jersey Mikes, and Advance Auto Parts in Boone. The purchase at Advance Auto Parts was for an AM/FM/CD radio. Boone Police investigators are seeking assistance identifying the person pictured in the surveillance images.